1. When did you first play Chrono Trigger? It was actually on an emulator at a friend's house. I remember that he told me to get to at least level 6 before I started following the storyline (something about beating down the first boss). 2. You're one of the four remixers to get a bonus addition; was doing the extra material difficult? The "extra material" is just the audition piece that didn't win title-track status, but was a decent enough song to remain a part of the project. 3. What do you use to remix? FL Studio, primarily. The things I plug into it are up for debate. 4. When did you get started with orchestral? About a year after I picked up composing/arranging. I guess that makes about 3 years ago? 5. How long did it take to make 'Predetermination'? 6. A Parting of Ways is moving; did you have anything in mind when you created it? I wanted to portray magus as a human being, not some boss monster you fight and win against who "oh look, now he's in my party." 7. Plan to work in another project? I'm supposed to be writing an arrangement of the overworld theme for the Dragon Warrior project. 8. How's it feel being part of a Chrono OCR site project now that it's complete? Pretty cool, I suppose. it's just another opportunity (and reason) for me to write music. 9. 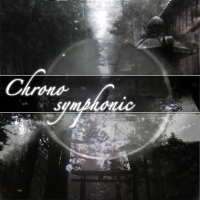 Anything you'd like to say to Chrono fans? You picked a good game to be a fan of. A Parting of Ways - In this piece I was trying to convey the side of Magus that we don’t get many glimpses of in the game – Magus as a human being, with emotions and internal struggles and that divine spark of goodness that all people have in them somewhere. And when the time comes, he shows that he too can reach within himself to pull hope from the ashes.